In this photograph, the organization Women-in-Action for the Prevention of Violence and Its Causes celebrates the opening of their headquarters at the Urban Ministries building, where they maintained a helpline for women in crisis. 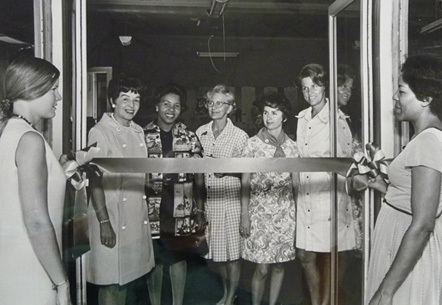 Elna Spaulding, pictured second from the left, founded and presided over this biracial group that acted as a catalyst for cooperation and integration between whites and blacks in Durham. Spaulding was inspired after attending a 1968 national conference for women convened to discuss how women might act to prevent the violence that had penetrated the Civil Rights Movement. She returned to Durham to build a group founded upon these ideals. The biracial group of a hundred women who first gathered at the YWCA were unused to meeting as equals on common ground. To establish mutual trust, they began with small, informal meetings at one another’s houses. There the women discovered a common concern for Durham’s schoolchildren. Their first goal was to help persuade Mayor Wense Grabarek LINK to establish a Human Relations Commission. Next they mediated between the Black Solidarity Committee for Community Improvement, who was leading a boycott of Durham stores, and the Merchants Association. In the fall of 1970, when the schools were fully integrating for the first time, the group persuaded the schools to hold open houses so that open communication and trust could be established between school administrators, teachers, students, and parents. In 1974 Mrs. Spaulding became the first female county commissioner.